Posted on October 3, 2015 by Steph Wilson. The team arrived in Adelaide in late September, and stayed at a Windsor Gardens Caravan Park. Like many caravan parks, it had many amenities like lodging, parking, laundry, and a small convenience store. But, the managers went above and beyond to provide us with anything that we needed. Before departing the US, we had spent a couple of weeks looking for a workspace that was within our budget. There was no success, and we continued searching after arriving. When the managers learned about this, they offered up their personal garage (called a car port in Australia). They let us use it and the adjacent parking lot (car park) to build up a wooden enclosure for our trailer. At that time, we were still waiting for the car to arrive and clear customs, so there was time to paint it maroon and gold with an silhouette outline of the car. After a few days of delays with shipping and customs, we were able to pick up the car and re-assemble it. The managers at Windsor Gardens let us continue using their garage as a workspace for the car. We were missing some supplies, so we had to wait for the next wave of the race crew to arrive. Once we got the car driving, we were allowed to use the roads of the caravan park to test drive and make sure everything still worked. We spent hours circling around, and many of the residents set up lawn chairs to watch the car drive by. Once we were confident in the cars abilities, we packed up and headed north to the Outback. 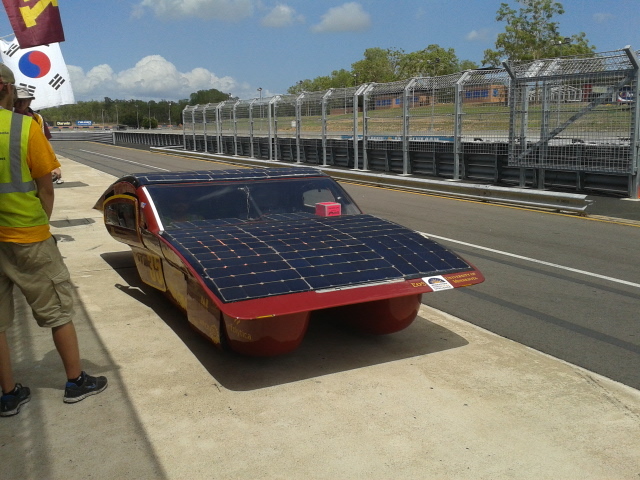 Unlike the US, in Australia, there are limitations on when and where solar cars can drive on public roads. 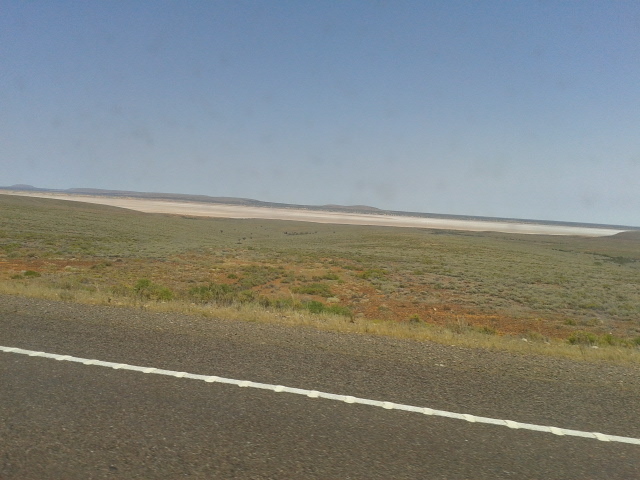 In the territory of South Australia, we had to register for a temporary permit. This permit was valid for a few days and the stretch of road was approximately 6 hours away from Adelaide. We reached the point where we could drive, unloaded the car, and hit the road. This stretch of road is part of the race route. This was great for simulating the environment that we will be racing in. We cant do that in Minnesota, so this helped with finding new bugs that we don't want to discover while on the race. One specific thing we encountered was that our motor controllers were heating up too much. We were able to remedy this before the race even started. We then headed to Darwin to check-in at the pit garages at the Hidden Valley Race Track. The very next day, the Northern Territory Motor Vehicle Registry came and inspected the car. After deeming the car to be road-safe, they issued a temporary permit and we were able to continue test driving on the Cox Peninsula Road. Over the next three days, the team got 35 hours of test drives in. That was nearly 100% utilization of every hour of sunlight available to us. During that entire time, the car performed well and we had no major breakdowns. The permit expired the day before the track opened, so the next step was track testing. The team put in a lot of hard work and signed up for several time slots every day. Things continued to go well and we started increasing speed, maxing out at 110 kph (68 mph). At the same time, we were working on preparing the car and the caravan for static scrutineering. Scrutineering is when the officials inspect the cars and make sure they follow the race regulations and are also safe to go out on the road. We had to go back a second time, but it was nothing major. We had to replace the rear view camera with a wider angle one to meet vision requirements, and we had forgotten to get our array signed off by a licensed professional. Those were easily fixed and we got greens on everything. The next step in qualifying was dynamic scrutineering and the hot lap to get the starting lineup. Dynamic scrutineering consisted of braking and stability tests. The stability test mimicked conditions that would be seen while changing lanes on a road while driving. We did well on this and then passed the brake test with flying colors. The car stopped in half the maximum distance. The officials had to do a double take to make sure we were going fast enough when starting the brake test. During the hot lap, we got a time of 2:17, and started at position 19 out of 42 (5th in the cruiser class). All green on the second try for scrutineering.